Every few months, I am going to take a recent submission from the Distressed Debt Investors Club and post it to the blog. This week, Tronox, a distressed debt situation authored by member jnahas, will be presented. This allows readers to see the quality / type of ideas being posted to the site which will help you decide if you would like to apply as a member or a guest. Currently, there are over 200 guest membership requests for the site - I have not approved them yet as we add some new and exciting functionality - member requests are being processed as they come in (we are up to 75 high caliber members posting a number of ideas each week). I will write an "Inside Look" post on the DDIC later on in the week for all that are curious. One quick point before posting this case: The Distressed Debt Investors Club allows users to upload attachments (Excel, PDFs, etc) to add to one's ideas. The author of the idea below attached a phenomenal Excel file to the write-up which goes through each point / comment in crucial detail. If you would like to see that Excel, well you are just going to have to apply as current members have access to it. With a strong management team, reduced debt burden and settlement of legacy liabilties Tronox represents an attractive investment opportunity. Tronox's projections are conservative and they should be able to achieve $145mm of EBITDAR in 2010. They have expsoure to fast growing markets in Asia through Australian JV and 40% of their volume is on long-term multi-year contracts with blue chip customers. At current trading levels you are creating the post-reorg equity at 6.5x 2010 projected EBITDAR of $130mm. Plan EV will likely be struck around this valuation as well, approximately $850mm. At exit the company will have $450mm of secured debt and net debt of $390mm and have 3x net leverage. In estimating potential returns, Tronox is best looked at as a distressed LBO, with the equity being created through the bond. No multiple expansion is need to generate a 30% IRR under relatively conservative assumptions for free cash flow with every dollar of debt paydown increasing equity value. The following analysis is base on the bonds having 80% pro forma ownership post-reorg. It would not be unlikely to see a sale to Huntsman in the future, albeit at a much higher valuation. The Chapter 11 filing does not include any of Tronox’s foreign operating subsidiaries. Tronox was set to sell the majority of its assets in a 363 sale to Huntsman for $415mm. An ad hoc bondholder group of the 9.5% Senior Unsecured Noteholders has proposed a plan of reorganization in conjunction with Goldman Sachs as replacement DIP and exit lender and the support of the Debtor. In, addition the EPA, a major other unsecured creditor, has reached an agreement to take $115mm cash and 88% of litigation proceeds against Anadarko Petroleum (purchased Kerr-McGee). The $115mm will be funded by a $105mm rights offering backstopped by the bondholder group and open to unsecured creditors who are accredited investors. On December 22, Huntsman dropped its motion to enforce the 363 Sale Bid Procedures and the debtor is committed to moving towards confirmation of the ad hoc bondholder plan. The timeline assumes approval of a replacement DIP facility(converts to exit facility) by 12/31/2009; 4/30/2010 approval of the Disclosure statement; 6/30/2010 plan cofirmation. Tronox Incorporated (TRXAQ or the Company) is the fourth largest producer of titanium dioxide (TiO2) pigments (93% of sales) in the world. Titanium dioxide is used in a range of products for its ability to impart whiteness, brightness and opacity. The pigment product is used in coatings for residential and commercial paint, industrial, automotive, specialty market, plastics such as polyolefins, PVC, engineered plastics, and paper and specialty products such as inks, food, cosmetics. The Company also produces electrolytic and other chemicals (7% of sales) used in batteries, pulp and paper, and pharmaceuticals, semiconductors, high-performance fibers, specialty ceramics, and epoxies. − Sales by Geography: United States 53%, Australia 18%, Germany 18%, and the Netherlands 12%. − Sales by Segment: Pigments 93% and Electrolytic/Other Chemicals 7%. − Sales by End-markets: Coatings 70%, Plastics 21% and Paper and Specialty 9%. With a strong management team, reduced debt burden and settlement of legacy liabilties Tronox representsan attractive investment opportunity. Tronox's projections are conservative and they should be able to achieve $145mm of EBITDAR in 2010. They have expsoure to fast growing markets in Asia through Australian JV and 40% of their volume is on long-term multi-year contracts with blue chip customers. At current trading levels you are creating the post-reorg equity at 6.5x 2010 projected EBITDAR of $130mm. Plan EV will likely be struck around this valuation as well, approximately $850mm. At exit the company will have $450mm of secured debt and net debt of $390mm and have 3x net leverage. In estimating potential returns Tronox is best looked at as a distressed LBO, with the equity being created through the bond. 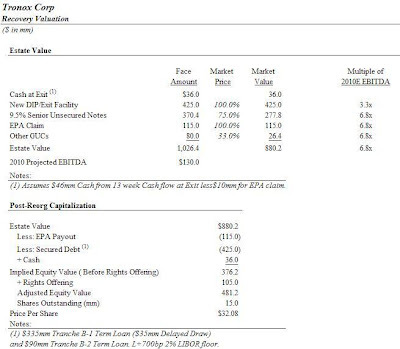 Nomultiple expansion is need to generate a 30% IRR under relatively conservative assumptions for free cash flow and every dollar of debt paydown increasing equity value. The following analysis is base on the bonds having 80% pro forma ownership post-reorg. It would not be unlikely to see a sale to Huntsman in the future, albeit at a much higher valuation. Adjusted for particpation in the rights-offering you are fully covered if you purchase the bonds at 75 with 2009P EBITDAR of $126mm at a 6.5x multiple and maintain significant upside. Huntsman, which was bidding for Tronox has 6.5x leverage and trades at 8.2x 2010E EBITDA and Kronos trades at 50x LTM EBITDA and 12.2x 2008 (Sr Sec Notes due 2013 yields 15%). Dupont (albeit far more diversified), the largest TiO2 producer with 20% of the market trades at 8.1x. Solutia, a post-reorg chemical name with 50% of its revenues tied to automotive and 3.5x levered trades at 7x 2009 and 6.3x 2010. Tronox should trade at a premium to Solutia. − Reorganized Business: Reorganized Tronox will emerge from chapter 11 as the owner and operator of the headquarters facility at Oklahoma City, Oklahoma and the titanium dioxide facilities at Hamilton, Mississippi and Botlek, Netherlands. Reorganized Tronox also will own and operate the electrolytic chemical facility at Henderson, Nevada (but Reorganized Tronox will not be responsible for environmental remediation at that site related to legacy contamination) and will hold Tronox’s interests in BMI, Landwell and the Tiwest Joint Venture in Australia. Reorganized Tronox will be funded by the Replacement DIP Facility, which will convert to exit financing on the Effective Date. − Recoveries for the Government/Environmental Settlement: In full satisfaction of all claims filed by the United States and its instrumentalities, and state, local or municipal governmental entities and in settlement of all civil obligations arising under environmental laws related to Tronox’s legacy environmental liabilities, these governmental entities will receive, collectively, $115 million in cash, 88% of Tronox’s interest in the Anadarko Litigation and certain other consideration. These amounts will be used to fund custodial trusts that will conduct remediation at sites presently owned by Tronox and satisfy remediation obligations at sites that are not owned by Tronox but at which Tronox may be liable for certain remediation costs. Under the Plan, reorganized Tronox will emerge from chapter 11 free and clear of such liabilities to the maximum extent provided under the law and all such claims shall be discharged. 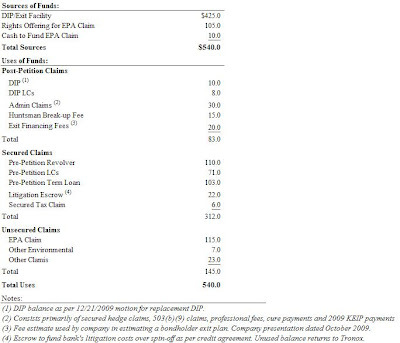 − Recoveries for Tort Claimants: Tort Claimants, who include, among others, holders of claims for personal injury and property damages arising from or related to environmental contamination, chemical, asbestos, benzene, creosote and other exposure, collectively will receive $7 million in cash, 12% of Tronox’s interest in the Anadarko Litigation and proceeds of applicable insurance policies. − Rights Offering: Holders of allowed general unsecured claims that are “accredited investors”, as that term is defined in Rule 501 of Regulation D of the rules and regulations promulgated under the Securities Act of 1933, will have the opportunity to participate in a $105 million rights offering that will be backstopped by the Bondholders. Participants in the rights offering will receive 70% of the equity in Reorganized Tronox. − Recoveries for Holders of General Unsecured Claims: Holders of allowed general unsecured claims will receive their pro rata share of the GUC Pool, which will be funded with 30% of the equity in Reorganized Tronox. − Recoveries for Holders of Private Party CERCLA Claims: Recoveries for claims of private parties under CERCLA and similar state statutes will be divided equally between participation in the GUC Pool and the Tort Claims Pool. − Anadarko Litigation: Interests in the Anadarko Litigation will be transferred to a litigation trust for the benefit of the government entities and those claimants sharing in the Tort Claims Pool. This trust will be administered by a trustee to be appointed by Tronox and the United States, in consultation with the representatives for the Tort Claimants and other governmental entities. Hunter-- I don't think the maximize image function is working for the picture at the bottom. Would love to be able to read it. Otherwise great post. Implied Equity Value." We are subtracting the EPA cash payment, so why not the other cash payments? Thanks. So this is the plan subject to discussions with the Official Equity Committee. I'm guessing those discussions won't go very well. Just a guess. - Where did you get the 15 million shares outstanding in coming up with a price per share? - I assume the Senior Unsecured Notes are being extinguished and just given equity? Or will they be repaid in full? - Don't you need to adjust the price per share based on whether you buy the Rights Offering or are one of the Other GUC holders? I believe your analysis said that the people subscribing to the Rights Offering will own 70% of the post-reorg equity. - Also, it says that you're subscribing to the rights offering at $10.40 per share. How did you arrive at that number? I'm just trying to understand the analysis and dynamics. Thanks very much!